Our tent was still set up today so we spent a lot of time playing in and around it in our back yard. Now that the drought is over, a few flowers in our yard have come back to life. 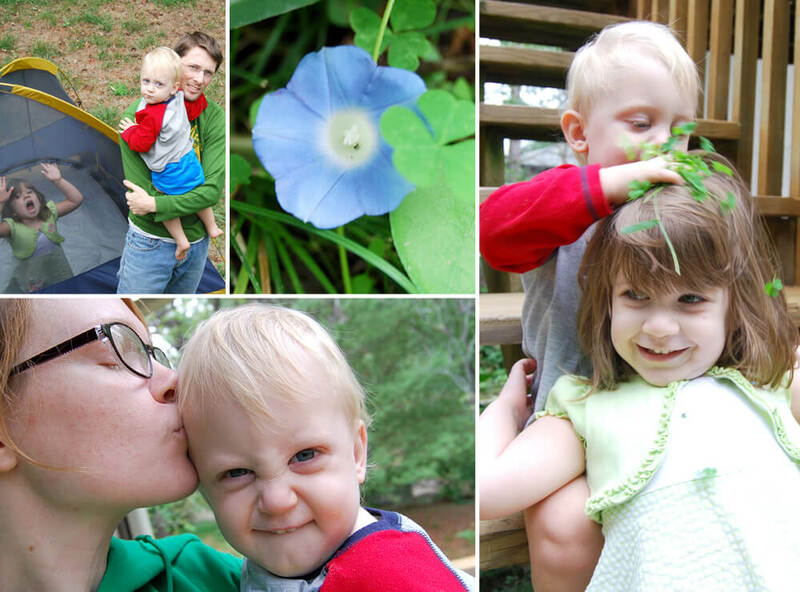 We spent some time playing outside in pajamas before bedtime tonight. Flynn’s favorite toy is a giant stuffed carrot from Ikea. It is adorable how much he loves that thing. 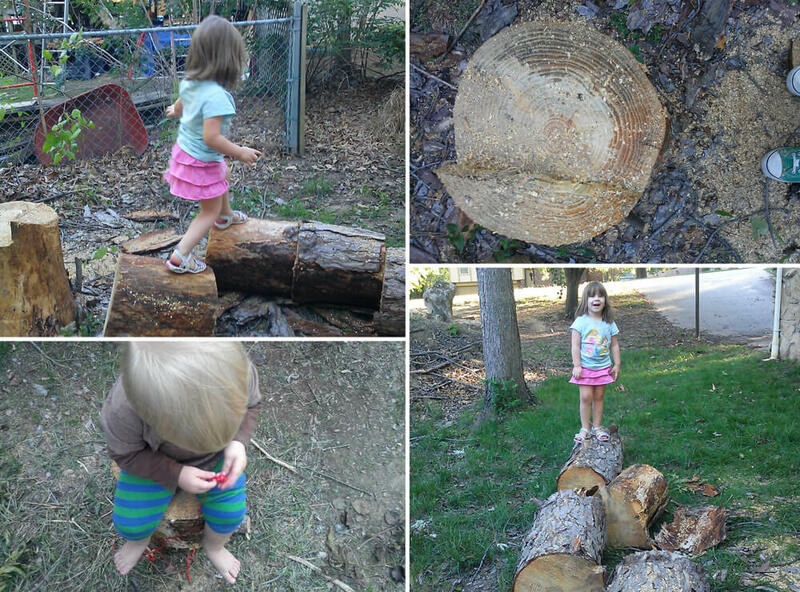 When I got home from work today, the kids were playing on what is left of our dead tree. Daddy finished cutting it down today and the kids helped him gather and stack the sticks. We now have quite a few nicely sized stumps for sitting on. Now we just need to build a fire pit! Our second dead tree came down today. This one was a much easier task. 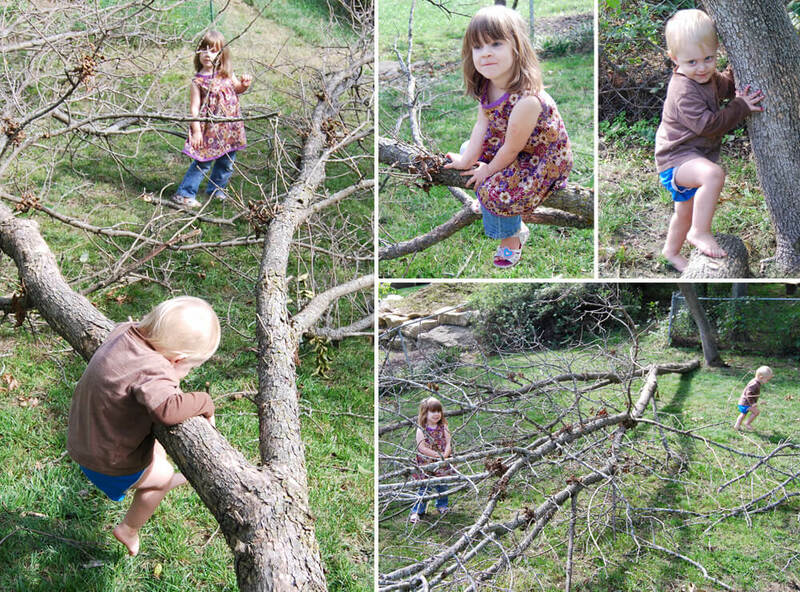 While Daddy worked on cutting it up, the kids had fun playing in their new jungle gym of branches. This tree landed on one of the watermelons in our garden and cracked it open, but it was ripe so they got to have a yummy snack! Before our quick grocery shopping trip today, we stopped outside and looked at all of the pumpkins. Juniper tried to pick one up, but quickly decided it was just TOO heavy. There were also a lot of birds flying overhead, we had fun watching them. Tonight we went to the corn maze! I’ve always wanted to try one, and it was lots of fun! 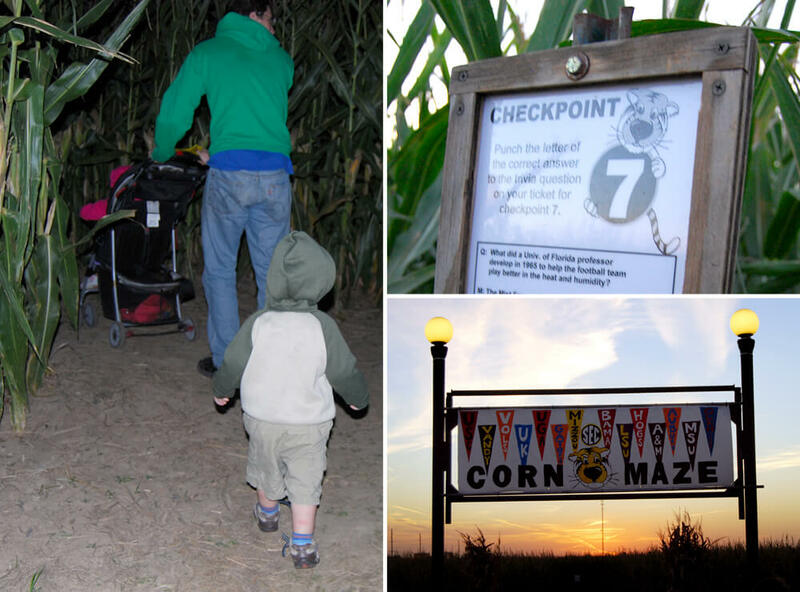 Flynn and Juniper enjoyed running aimlessly through the maze while Daddy and I tried to find all of the checkpoints. It got dark pretty quickly, and we only found 4 of them. Next year we’ll go earlier in the day and get them all! Happy first day of fall! The weather today was perfect. Sunny and cool enough to wear a light jacket. 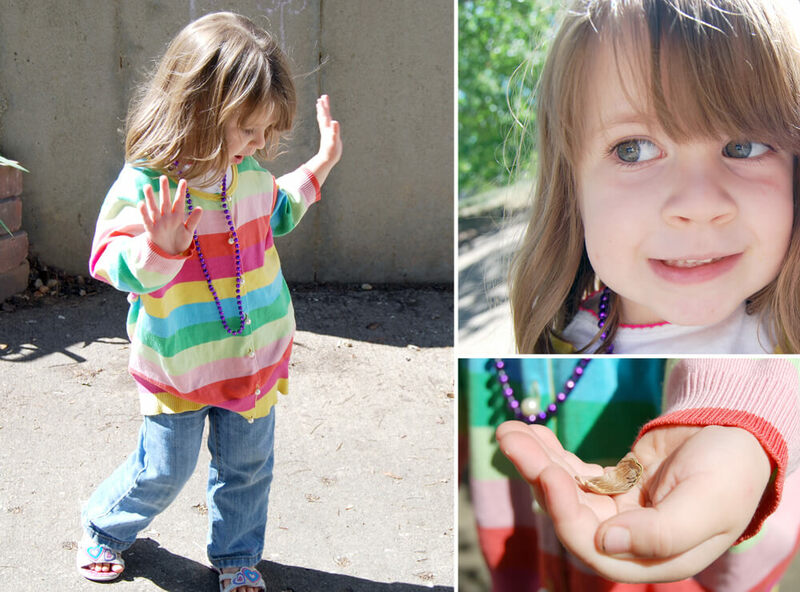 We played outside for a bit before heading to our cousins house, and I took lots of pictures of Juniper getting her groove on in our driveway. Pretty flower! Cute face, Flynn! 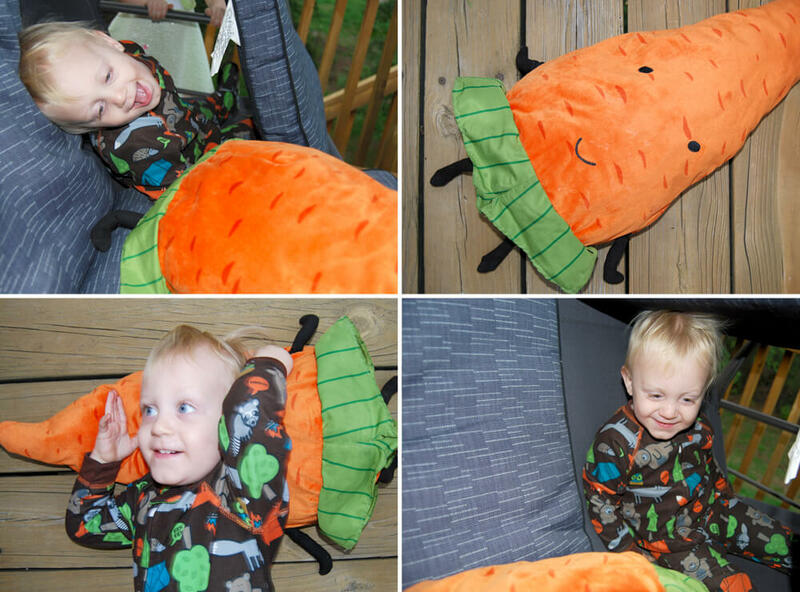 I wonder if it's the color or the feel or the shape or exactly what it is about the carrot he loves. Did you think to cut one of the stumps short for little legged folk? 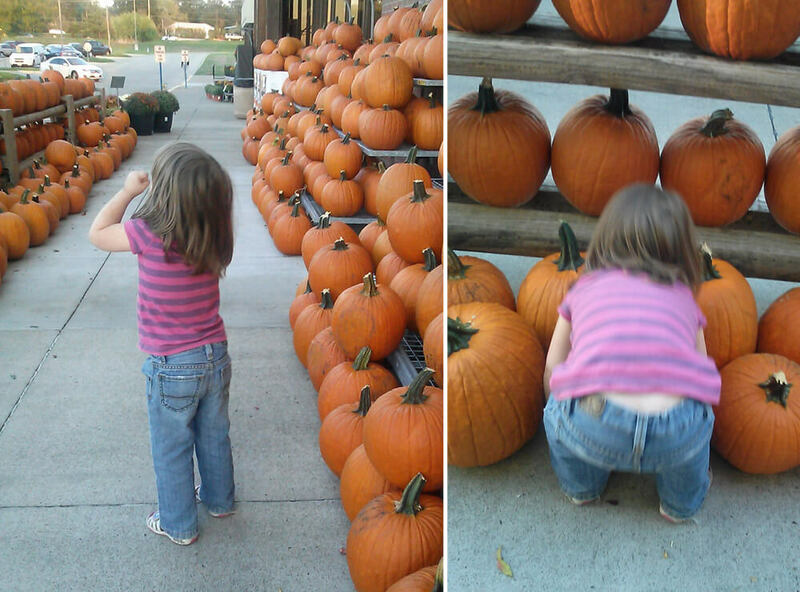 Did you buy a pumpkin or grow one or neither of the above? Get your groove on girl! Wooly bear?